Endeavor Hospitality Group revealed that its first portfolio property—the Marriott Courtyard New York Midtown West—will be driven by thoughtful and sophisticated contemporary design, marked by eclectic furnishings, metallic accents, an on-trend neutral color palette and eco-friendly elements. 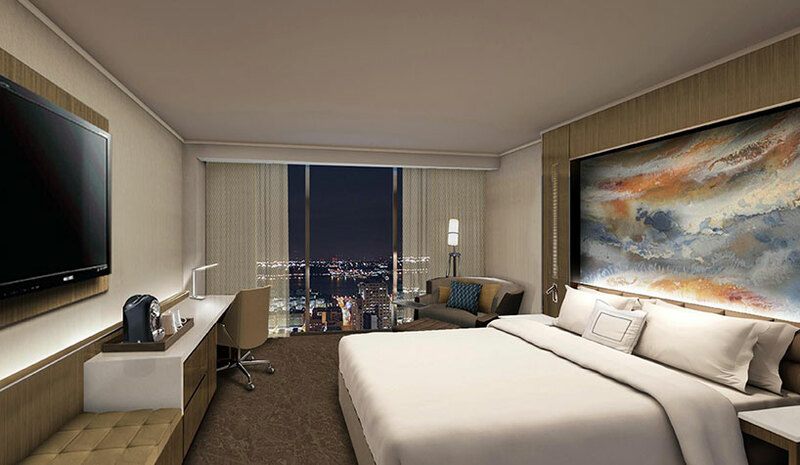 The 28 story, 399-room hotel, including 26 suites, is slated to open mid-year and is designed to reflect its location in Manhattan’s Hudson Yards District, blending urban elements with modern amenities. The Hilton Checkers Hotel in Los Angeles completed a multimillion-dollar renovation that honors its historic past while creating a welcoming ambience for guests. The transformation includes the addition of the new 1927 Bar+Kitchen that embodies the timeless splendor of the roaring 20’s. In addition, each of the hotel’s 193 guestrooms and suites received a complete refresh with new soft goods, furnishings, and bathrooms. The public spaces and 3,300 sq. ft. meeting space were reimagined with a new deep blue and gray color palette accented with rich gold tones. The property is owned by Chesapeake Lodging Trust and managed by Crestline Hotels & Resorts LLC. The Madison Washington D.C., a Hilton Hotel, has completed its $4-million hotel transformation inspired by Dolley Madison’s legacy and trailblazing spirit. The 356-room hotel, located in the heart of downtown Washington, DC, four blocks away from the White House, renovated its lobby and adjacent common areas and introduced Lady M, an upscale cocktail lounge. Conceptualized by The Gettys Group, this newly debuted design merges traditional elements with modern textures and soft color schemes, resulting in a space that celebrates the dynamic duality of James and Dolley Madison. From the furnishings to the finishes, each piece plays a part in connecting guests to the legacy of the building, its location in the nation’s capital, and the characters of James and Dolley Madison themselves.